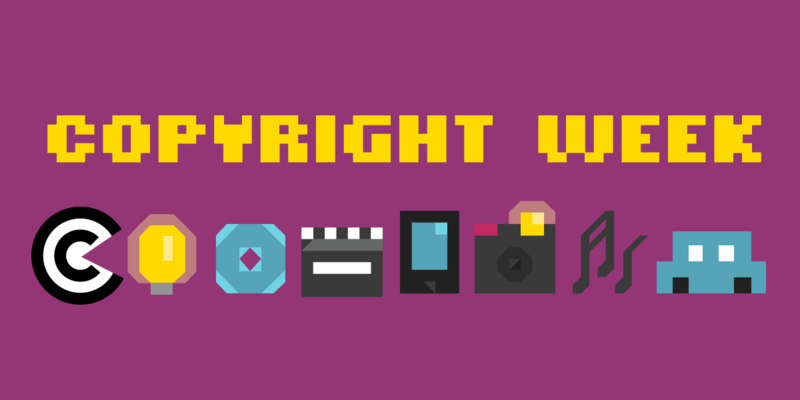 We're taking part in Copyright Week, a series of actions and discussions supporting key principles that should guide copyright policy. Every day this week, various groups are taking on different elements of copyright law and policy, and addressing what's at stake, and what we need to do to make sure that copyright promotes creativity and innovation. Copyright affects so much about our daily lives, often in ways people don’t even realize. It obviously impacts the movies we watch, the books we read, and the music we listen to. But it also impacts everything from who can fix a tractor to what information is available to us to when we communicate online. That means that copyright law and policy should be made to serve everyone. Unfortunately, that’s not the way it tends to work. Instead, copyright law is often treated as the exclusive domain of major media and entertainment industries. They’ve been able to shape a law that affects us all to suit their desires, making it harder and harder to access, use, and work with content, information, and devices that we have rights to. That doesn’t mean we can’t change the status quo. Seven years ago this week, a diverse coalition of Internet users, non-profit groups, and Internet companies defeated the Stop Online Piracy Act (SOPA) and the PROTECT IP Act (PIPA), bills that would have forced Internet companies to blacklist and block websites accused of hosting copyright infringing content. These were bills that would have made censorship very easy, all in the name of copyright protection. This year sees another positive development in the world of copyright: January 1, was the first day in decades that saw new works enter the public domain in the United States. In theory, copyright is supposed to grant exclusive rights for a limited period—enough time for creators to make money off of their works, incentivizing them to create them. Once copyright expires, works enter the public domain, where anyone can make any use of them, perpetuating the cycle of culture building on itself that drives innovation and creation. In an example of how large media and entertainment companies successfully make copyright laws for themselves, they prefer to have control of things long after the people who actually created them have passed away. They successfully lobbied to have the term of copyright extended, essentially keeping the public domain from growing for decades. The public domain is an important resource for anyone looking to study, build on, or preserve culture. This year, we finally see it grow again. Monday: Copyright as a Tool of Censorship. Freedom of expression is a fundamental human right essential to a functioning democracy. Copyright should encourage more speech, not act as a legal cudgel to silence it. Tuesday: Device and Digital Ownership. As the things we buy increasingly exist either in digital form or as devices with software, we also find ourselves subject to onerous licensing agreements and technological restrictions. If you buy something, you should be able to truly own it–meaning you can learn how it works, repair it, remove unwanted features, or tinker with it to make it work in a new way. Wednesday: Public Domain and Creativity. Copyright policy should encourage creativity, not hamper it. Excessive copyright terms inhibit our ability to comment, criticize, and rework our common culture. Thursday: Safe Harbors. Safe harbor protections allow online intermediaries to foster public discourse and creativity. Safe harbor status should be easy for intermediaries of all sizes to attain and maintain. Friday: Filters. Whether as a result of corporate pressure or regulation, overreliance on automated filters to patrol copyright infringement presents a danger to free expression on the Internet. Every day this week, we’ll be sharing links to blog posts and actions on these topics at https://www.eff.org/copyrightweek and at #CopyrightWeek on Twitter. As we said last year, and the year before that, if you too stand behind these principles, please join us by supporting them, sharing them, and telling your lawmakers you want to see copyright law reflect them.